Omega-3 fatty acids are nutritious unsaturated fats that are naturally found in fish such as herring, salmon and tuna. Among plants, flax is perhaps the best source for omega-3 fatty acids, though avocados and broccoli also have small traces of this important nutrient. 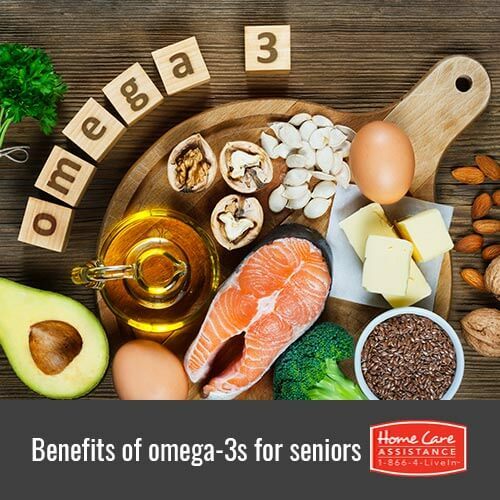 Following are six reasons Oshkosh elder care providers should encourage seniors to consume more omega-3s. Omega-3 fatty acids can regulate the levels of triglycerides in the bloodstream. To reduce the risk of clogged arteries, seniors with imbalances of both HDL and LDL cholesterol are encouraged to eat this nutrient on a regular basis and cut down on saturated fat and reduce the risk of stroke and the need for post-stroke care in Oshkosh. Just like other unsaturated fats, omega-3s significantly cut the risk of cardiovascular diseases. In Asia and the Mediterranean regions, people who eat a lot of seafood have very low incidences of heart attacks and strokes. Fish oil can also stimulate proper blood circulation throughout the entire body. The anti-inflammatory properties of omega-3 fatty acids have been confirmed by worldwide scientific communities. These fatty acids reduce inflammation that naturally comes with aging such as migraines or sore muscles. Doctors often recommend that omega-3 supplements or natural sources be taken along with prescription anti-inflammatory drugs. Omega-3s that are derived from fish oil can be effective in managing the symptoms of rheumatoid arthritis. That is because this nutrient improves the overall strength and stiffness of bones and joints. Seniors who consume omega-3s from fresh seafood are likely to see major improvements in their flexibility and dexterity of the limbs. Although nothing can prevent or cure dementia, cognitive disorders can be delayed with a regular intake of omega-3s. Fatty acids in general are known for their important roles in regulating normal brain function, particularly in terms of memory and motor function. Omega-3s can also reduce the risk of depression by balancing chemical receptors in the nervous system. Omega-3 fatty acids are beneficial for seniors who live with respiratory problems such as asthma or COPD. This nutrient can loosen up the airways that normally constrict due to these conditions. Omega-3s also make it easier for seniors to breathe after engaging in moderate exercise or physical therapy. Make sure your loved one consumes the right amount of omega-3s with help from Home Care Assistance of Oshkosh. Our comprehensive stroke, Alzheimer’s, and dementia home care in Oshkosh gives seniors the assistance they need with daily activities such as meal preparation and exercise in order to promote physical and mental wellbeing. Let us customize a care plan for your loved one today when you call (920) 710-2273 to set up a free in-home consultation.